Biodiesel is a renewable fuel made from various feedstocks, including refined vegetable oils, recycled cooking oils, and rendered animal fats. Different feedstocks produce biodiesel with distinct qualities that must be considered when blending biodiesel with petroleum diesel for use in transportation. Biodiesel is often blended with petroleum diesel in percentages ranging from 5% to 20% biodiesel, or B5-B20. The Renewable Fuel Standard (RFS), a federal program that mandates the blending of biofuels into the nation’s fuel supply, has generally encouraged higher biodiesel blends through targets that have increased over time. Refined vegetable oils, particularly soybean oil and canola oil, have been the most common biodiesel feedstock types in the United States. 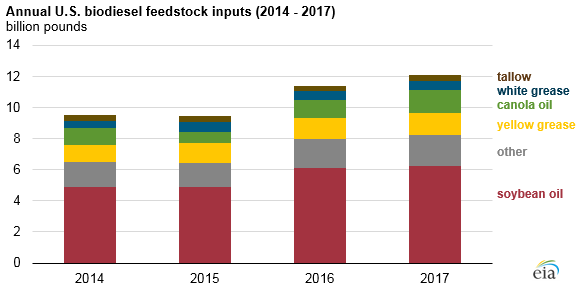 Soybean oil accounted for about half of biodiesel feedstocks inputs between 2014 and 2017. Soybeans are grown primarily in the Midwest, where most biodiesel production capacity is located. Soybean oil use for biodiesel production increased about 30% from 2014 to 2017. Other biodiesel feedstock types include recycled cooking oils and rendered animal fats that have little or no value for human consumption. Yellow grease (used cooking oil from restaurants) to produce biofuel increased almost 40% over the past four years, from about 1.0 billion to 1.5 billion pounds, and accounted for more than 10% of total biofuel feedstock in 2017. Tallow (beef fat) and white grease (pork fat) each provided about 3% to 6% of total feedstock inputs between 2014 and 2017. The composition and characteristics of biodiesel are distinct among the various feedstocks and their petroleum-based equivalent—ultra-low sulfur diesel (ULSD)—which is the most common type of diesel used for transportation. These attributes are considered when producing a transportation fuel that meets industry standards. The cloud point refers to the temperature below which wax begins to form in fuels. Solidified waxes can clog engine fuel filters and injectors. Biodiesel produced from feedstocks such as inedible tallow may require the use of additives or blending at higher levels with lower cloud point ULSD to mitigate cold weather concerns. The cetane number is an indicator of the fuel’s propensity to auto-ignite predictably in a compression-ignition engine. Higher cetane is often associated with improved performance and being a cleaner burning fuel. Most biodiesel feedstocks have slightly higher cetane numbers than ULSD, which usually has a minimum allowable cetane value of 40. The oxidative stability measures the ability of fuel to resist oxidation during storage and use. Fuels with a lower oxidative stability are less likely to form peroxides, acids, and deposits that adversely affect engine performance. Because it generally has lower oxidative stability, petroleum diesel can be stored longer than biodiesel feedstocks such as white grease and tallow. Biodiesel producers may use additives to extend the storage and usage timelines of biodiesel. ULSD sold in the United States often contains some amount of biodiesel because of the benefits it adds to the ULSD, including additional lubrication and potentially prolonging the lifetime of certain engine components. In 2017, biodiesel accounted for about 4% of total diesel consumption. EIA’s Monthly Biodiesel Production Report provides additional information on the production, inventories, feedstocks, and sales of U.S. biodiesel producers.